1. THE COMPETITION IS OPEN TO ALL CARTOONISTS OF THE WORLD. 2. BOARD MEMBERS OF KIMSE YOK MU ASSOCIATION, MEMBERS OF THE SELECTION COMMITTEE AND THEIR IMMEDIATE RELATIVES CANNOT PARTICIPATE IN THE COMPETITION. 3. IN THE CARICATURES SUBMITTED TO THE COMPETITION, THERE SHALL BE NO DISCRIMINATION OF RELIGION, LANGUAGE, OR RACE, AND THE CARICATURES SHALL BE IN CONFORMITY WITH PUBLIC DECENCY. 4. ANY TECHNIQUES CAN BE USED TO DRAW THE CARICATURES. THEY CAN BE BLACK AND WHITE OR COLORED. 5. THERE SHALL BE NO REMARKS IN CARICATURES. IF AN EXPLANATORY REMARK IS TO BE USED IT SHALL BE DEFINITELY IN ENGLISH. 6. EACH PARTICIPANT CAN SUBMIT UP TO THREE (3) WORKS. 7. THE FORMAT OF THE CARICATURES SHALL BE JPG OR JPEG, WITH 300 DPI RESOLUTION. 8. THE COMPETITION PARTICIPANTS SHALL MAKE THEIR APPLICATIONS ON THE COMPETITION’S FORMAL WEBSITE: WWW.KYMCARTOON.COM. 9. PARTICIPANTS WILL ENTER INTO THE COMPETITION BY UPLOADING THEIR CARICATURES TOWWW.KYMCARTOON.COM. 10. THE PROPOSALS SHOULD NOT HAVE BEEN ISSUED BEFORE IN DIGITAL OR PRINTED AND IT SHOULDN’T HAVE GAIN AWARD IN A COMPETITION BEFORE. 11. FOLLOWING THE COMPETITION, IN CASE A CARICATURE IS DEEMED AS NOT CONFORMING TO THE SPECIFICATIONS, ITS ORDER AND AWARD ARE REVOKED. SUCH A COMPETITOR IS DEEMED AS HAVING VIOLATING THE RULES. SELECTION OF A NEW CARICATURE INSTEAD OF THE REVOKED ONE IS AT THE DISPOSAL OF THE SELECTION COMMITTEE. 12. A PARTICIPANT CANNOT RECEIVE MORE THAN ONE AWARD. 13. THE RESULTS OF THE COMPETITION WILL BE ANNOUNCED TO THE CARICATURISTS WHO ARE GRANTED AWARDS AND TO THE MEDIA. IN ADDITION, THEY WILL BE ANNOUNCED ONWWW.KYMCARTOON.COM AND WWW.KIMSEYOKMU.ORG.TR . 14. 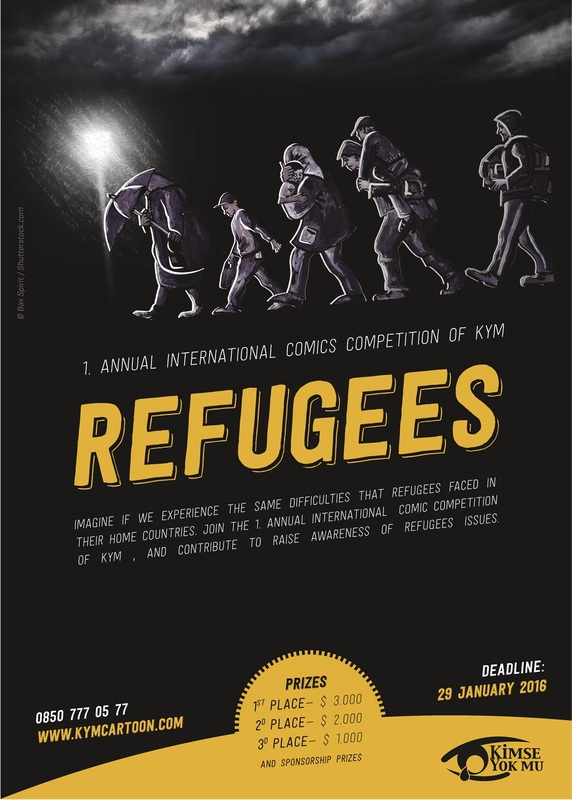 KIMSE YOK MU ASSOCIATION WILL PAY THE NECESSARY TRAVEL AND ACCOMMODATION EXPENSES OF THE CARICATURISTS, GRANTED WITH THE FIRST THREE (3) AWARDS IN THIS COMPETITION (WITHIN THE SCOPE OF THIS SPECIFICATION), FOR THEIR PARTICIPATION IN THE AWARD CEREMONY. 15. THE CARICATURES SENT TO THE COMPETITION MAY BE PUBLISHED AND REPRODUCED BY KIMSE YOK MU ASSOCIATION ON CARDS, POSTERS, BANNERS, ALBUMS, NEWSPAPERS, MAGAZINES, BOOKS, CDS, AND SUCH, AND EXHIBITED. NO COPYRIGHT SHALL BE PAID FOR THESE PROCEDURES. HOWEVER, THE OWNER MAY BE NOTIFIED ABOUT THE DEVELOPMENTS. 16. CARICATURES MUST BE UPLOADED TO WWW.KYMCARTOON.COM BY FRIDAY, JANUARY 29TH, 2016 UNTIL 23:59 TURKISH LOCAL TIME. 17. A DIGITAL PARTICIPATION CERTIFICATE WILL BE SENT TO ALL PARTICIPANTS OF THE COMPETITION VIA EMAIL. 18. ALONGSIDE THE WORKS TO BE GRANTED AWARDS, THE SELECTION COMMITTEE WILL ALSO CHOOSE CARICATURES TO BE USED IN EXHIBITIONS AND ON ALBUMS. 19. THE SPECIFICATION OF THE COMPETITION CAN BE DOWNLOADED FROM WWW.KYMCARTOON.COM. 20. THE PARTICIPANT ACCEPTS AND DECLARES IN ADVANCE THAT HE/SHE HAS THE POSSESSION OF THE CARICATURE(S) WITH WHICH HE/SHE PARTICIPATES IN THE COMPETITION BY FILLING OUT THE APPLICATION FORM AND TRANSFERS THE USAGE RIGHTS OF TOOLS FOR PROCESSING, REPRODUCTION, DISTRIBUTION, REPRESENTATION AND INDICATION, AUDIO AND/OR VISUAL TRANSFER PLUS FINANCIAL RIGHTS OF TRANSFER OF SUCH TO PUBLIC DEFINED IN ARTICLES 21 – 25 OF LAW NO. 5846 ON INTELLECTUAL AND ARTISTIC WORKS INCLUDING TRANSFER OF SUCH TO THIRD PERSONS WITHOUT ANY LIMITATIONS REGARDING LOCATION, DURATION AND AMOUNT, EXCLUSIVELY TO KIMSE YOK MU ASSOCIATION, HE/SHE GIVES CONSENT THAT KIMSE YOK MU ASSOCIATION MAY USE THE SAID CARICATURE IN ANY WAY POSSIBLE INCLUDING BUT NOT LIMITED TO EXHIBITING, ARCHIVING OR PUBLISHING OF SUCH ON INTERNET AND OTHER MEDIUMS, HE/SHE DOES NOT HAVE ANY OWNERSHIP REGARDING THE FINANCIAL RIGHTS WHICH CONSIST OF THE SUBJECT MATTER OF TRANSFER AND THEREFORE HE/SHE CANNOT TAKE ACTION AGAINST 3RD PERSONS REGARDING THE TRANSFERRED FINANCIAL RIGHTS. 21. IN MATTERS NOT STATED HEREIN THIS TERMS OF PARTICIPATION AND IN CASE OF INDECISION, THE RESOLUTIONS OF THE ORGANIZING COMMITTEE SHALL BE VALID. 22. ALL COMPETITORS ARE DEEMED TO ACCEPT THE PROVISIONS OF THIS SPECIFICATION BY PARTICIPATING IN THE COMPETITION.